Often called "athlete’s foot," an outbreak of foot fungus typically appears as an itchy rash, blisters, dry, cracked skin on the sole, or as painful cracked skin between toes. This highly contagious infection can also cause an extremely offensive odor. Organic soap company Vermont Soapworks has teamed up with PediFix to create Fungasoap, an all-natural liquid soap that fights foot fungus. 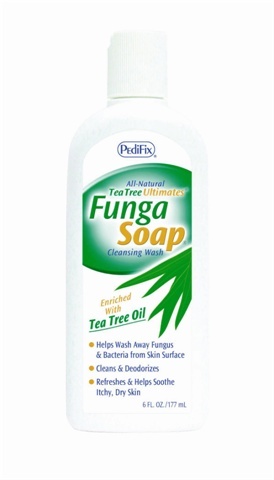 The soap is enriched with tea tree oil, an essential oil that has been used to fight fungal infections for centuries. A great retail item to rid clients of athlete’s foot, Fungasoap contains natural and organic ingredients that wash away fungus and bacteria, and soothe itchy, dry, and inflamed skin. Fungasoap contains saponified coconut, olive and jojoba oils, organic aloe vera, a natural essential oil blend featuring peppermint and tea tree oil, and rosemary extract. For more information, visit PediFix.